March 29, 2011 Dan O. Football is a lot more messed up than I thought. Master director Oliver Stone crafted this look at the gritty world of professional football, capturing the trials and tribulations of the fictional Miami Sharks, a team beset by unnecessary roughness on and off the field. 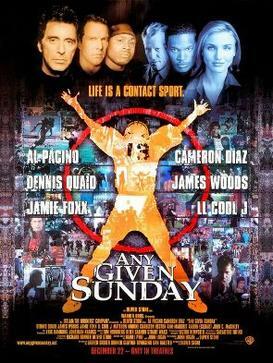 Stone’s brilliant ensemble cast includes Al Pacino, Jamie Foxx, Cameron Diaz and Dennis Quaid in a full-blown assault on the senses, portraying every tackle, pass — and torn ligament — in vivid detail. I like, and I play football. I think it’s tough, fun, and overall vicious sport that if your good at, well then be ready for the big bucks. However, sports in today’s world isn’t always the happiest place to be. Oliver Stone knows what I’m talking about. As usual with an Oliver Stone film, this is packed and packed with a lot of information, and stories that all seem to occupy the 2 hour and 43 minute time limit. This film is very long, and I must say that if you do not want to sit by a movie for a very long time, where you may not like many of the characters, you may not want to check this film out. There are a lot of interesting parts every once and awhile, and Stone does a great job of filming it all. The football scenes are perfect by the way they portray every hit, every cheer, every sack, and every single little piece of pain that is involved within a game of football. He also uses his crazy camera-work, that moves from story to story, and the use of loud, percussive music and rap feel like life itself and it keeps us involved with this film as well as the big game itself. I just wish that there were more parts to this film that seemed like they were needed. I feel like Stone was putting some of these random parts in to create more compelling stories that would have us attached to all of these characters, and it just kind of got tire-some. There seemed to be more random parts then there were actually parts that were needed in this film, but I will give Stone credit for at least adding all these other elements to this film to get the full spectrum, and at least make it something easy to follow. The script isn’t so bad either, it’s just all over the place, but it is entertaining cause it shows the world we live in where the game has changed from being prideful to more commercial. Al Pacino is perfect and exactly what his character requires: a hard-arsed, old school coach with more honor than commercial savvy. He loves the game he discovered 30 years ago and cannot face the prostitute that it has become. Dennis Quaid is great as the faded glory of the old game: tattered, bruised, bleeding and down but not quite out. Together they quantify everything that is good about sport. Cameron Diaz is surprisingly good as Al’s polar opposite: young, fiscal and dynamic. She has inherited a job she doesn’t want but cannot quit. She sees football as a game of commerce, not endeavor. She is supported by an amazing Jamie Foxx, the tough, brash youngster given a shot at the top position and grabbing it for all he’s worth. Together they quantify everything that is real about sport in the USA. I liked how the film showed how these two opposing sides faced off against each other, even though their all on the same side. It’s old school vs. new school, and you get to decide who wins in the end. There are others in this huge ensemble cast that are worth noting such as LL Cool J, James Woods, Matthew Modine, John C. McGinley, Aaron Eckhart, Lawrence Taylor, and the man himself, Jim Brown. Consensus: Oliver Stone’s “football movie” is a bit messy and some parts don’t seem like they belong at all, but Stone’s direction that captures the perfect feel of the game, and the perfect performances of the cast make this a film that any football fan can and probably will enjoy. It will just take about 2½ hours out of your day to watch it. It’s an OK film. In fact, I think Oliver Stone hasn’t been the same in recent years. If he makes one more bad movie. He should just retire. There are some moments I like in the film like Pacino, Quaid, and Jamie Foxx. Yet, it was very uneven and Stone has a penchant for excess that always hurt his films. He does have too many ideas yet he needs to simplify things in this film particularly. Very True! However, I do think that a lot of his ideas, and how he shows them on film is one of his strong-suits and right here it gets a little messy, but still works well when it comes to the entertainment level. I actually like a lot of Oliver Stone films. Platoon is my favorite film, and I think JFK is exceptional. Next I would have Born on the Fourth of July, The Doors and this. While it tends to divert into unnecessary waters at times, it is still a pretty extensive fictional account of the world of the NFL. The players, the coaches (a great performance from Al Pacino), the owners and even the trainers are all given time, and both the greed and selfishness created through success and the heart and desire to be successful rouse emotions throughout. The in-game sequences are pretty amazing. I’d give it an 8/9. It’s a fun film, and Stone is actually a favorite of mine and never stops to amaze me really. Platoon is my favorite as well from him! Man, I loved this film. I still do – even if the brash, machismo-soaked style employed by Stone for this could be considered almost visually offensive. Pacino shows (again) why he is The Man, Jamie Foxx plays himself as the cocky young ingenue quarterback, and Cameron Diaz has never looked so out of her depth in a film…..
It’s good, and all the stuff that happens is crazy, but at the same time you can’t look away.